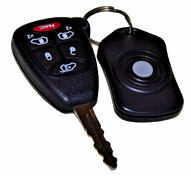 Please take time to link to my site if It helped! Detailed Menu of Everything else HERE! Why ALL Powerchairs NEED to be Off Road Capable! Electric Cars are a Joke! This is my latest "Drive From WheelChair" Vehicle. 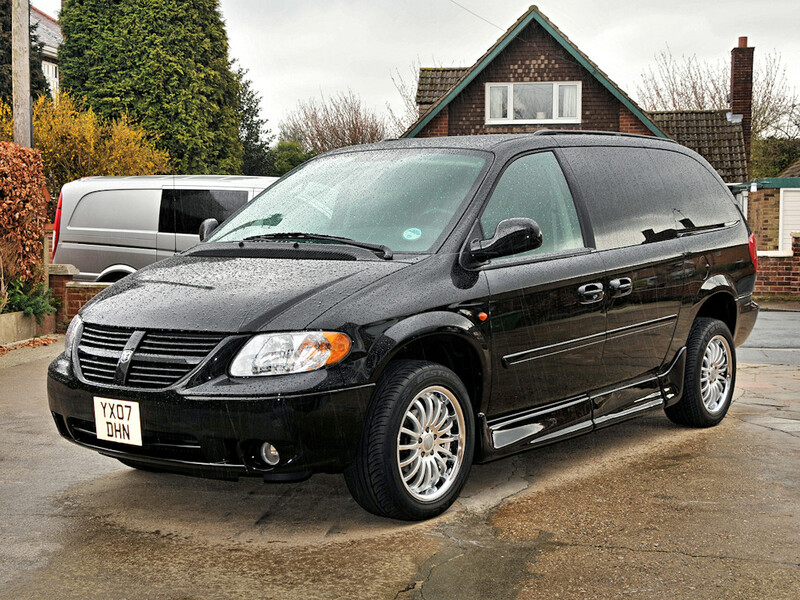 This is an American built vehicle that I had imported into the UK by Alfred Bekker, a mobility specialist, so it has the steering wheel on the left side. Don't let that worry you though! After driving it for a few miles it feels perfectly natural. Never understood the fear of left hand drive cars many people seem to have. After 5 mins you totally forget about it. 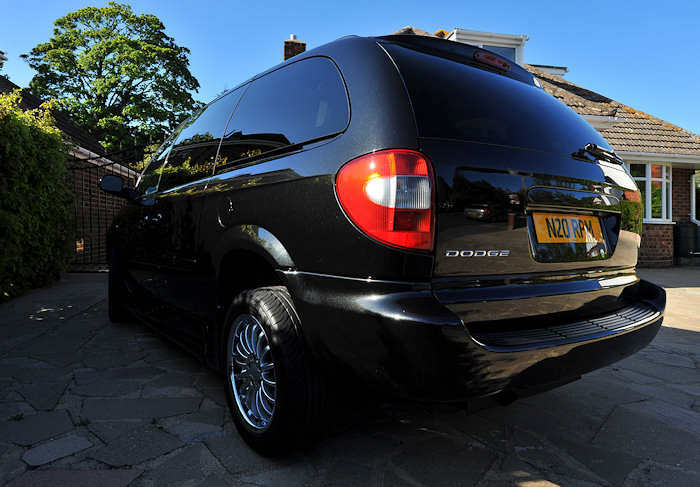 Its actually almost the same vehicle as the UK's right hand drive version the Chrysler Grand Voyager. Click image for a larger view! Or click here for an even bigger image! UKs Grand Voyager is the same vehicle as the US Town and Country / Dodge caravan with the complete floor pan reversed (mirrored) so we can have the steering wheel on the correct side! And in the UK it comes with either a pretty good (for a diesel) 2.8 common rail 4 diesel auto, or a pretty torque less 3.3 litre V6 which isn't a very nice engine and it gets coarse when revved. 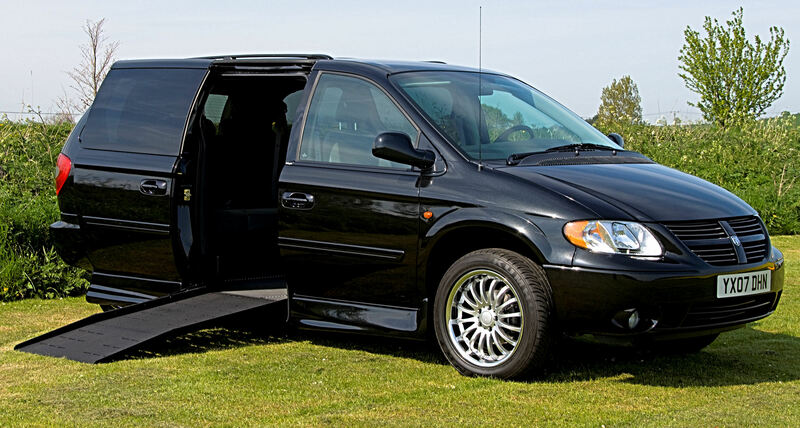 US gets the Chrysler Town and Country which has the steering wheel on the wrong side and a almost identical trim/colours etc. It has the radio antenna on the front wing instead of being built into a window and one or two other minor differences. Oh and the MPG indicator is wrong too! They stole our Gallon (much like our language) and got both wrong! So the MPG indicator looks really scary if you happen to be English! Their gallon is incorrectly sized and considerably smaller! Oh and it only comes with a good 200+ BHP 3.8 litre engine which is smooth and never needs to be revved! And an auto box. Its basically the same as the 3.3 engine we get stuck with but massively better to drive for the extra low down power. Both units don't like to be revved but the 3.3 has to be whereas the 3.8 doesn't need to be... And unlike the deseasels its very quiet too! 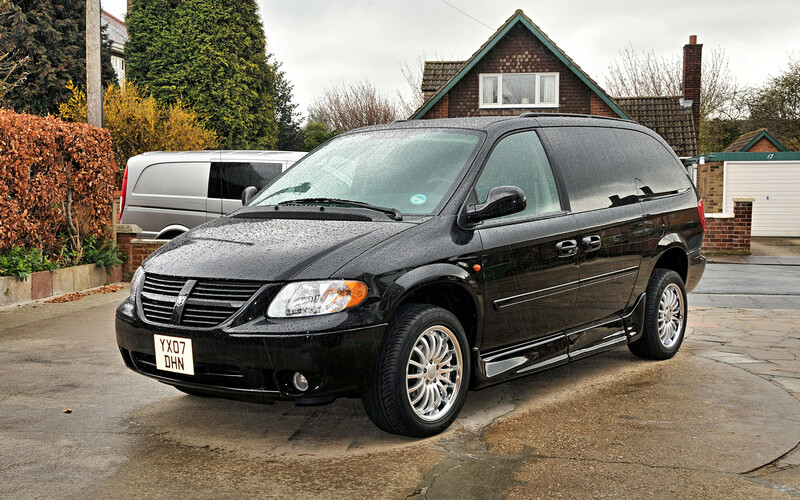 Lowered floor minivan medium | Lowered floor minivan large! What modifications are done to this Dodge minivan to make it a ROLLX wheelchair van? Well first of all its delivered from the production line to the ROLLX factory to have its insides and its complete floor removed. I have seen this operation in progress at Alfred Bekker in the UK as he builds similar right hand drive ones for our market with Rollx parts. Trust me its a very major modification with the vehicle almost completely dismantled and much welding and many new parts! Its not a thing to be undertaken lightly! The complete floor is cut out, and replaced with a new one 10 inches lower. The suspension is raised a couple of inches before being refitted to allow ground clearance for the dropped floor level. 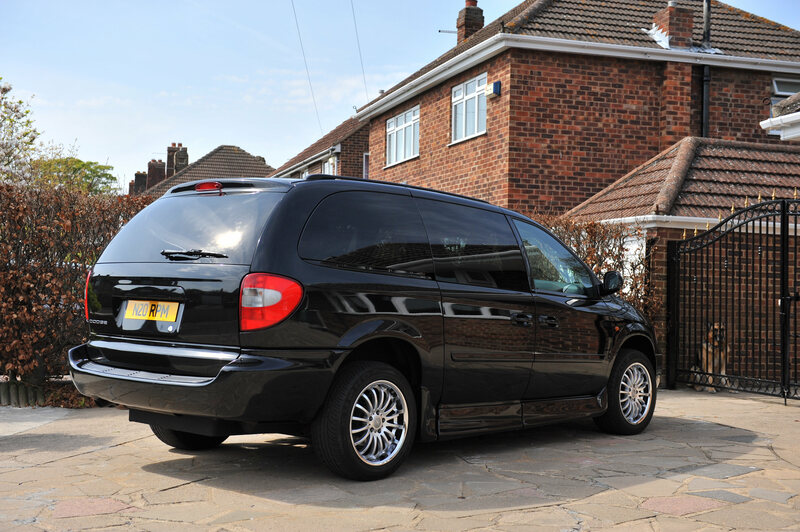 This gives plenty of headroom inside for a large power wheelchair with its occupant. Fuel tank air conditioning and brake lines and wires as well as exhaust systems are all extensively moved/replaced/relocated. A computer system and a special winch device is installed into the rear under the floor. 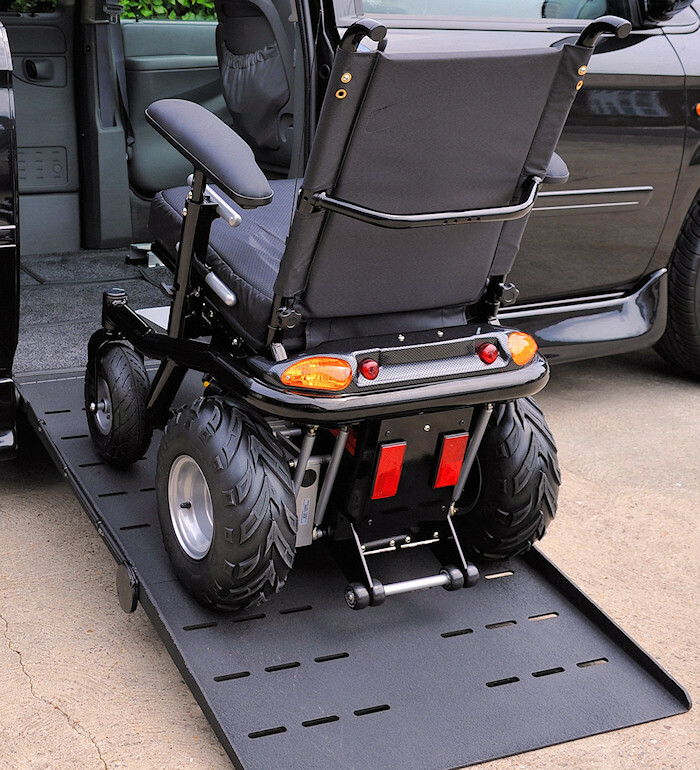 As well as an electric in floor or fold up ramp. 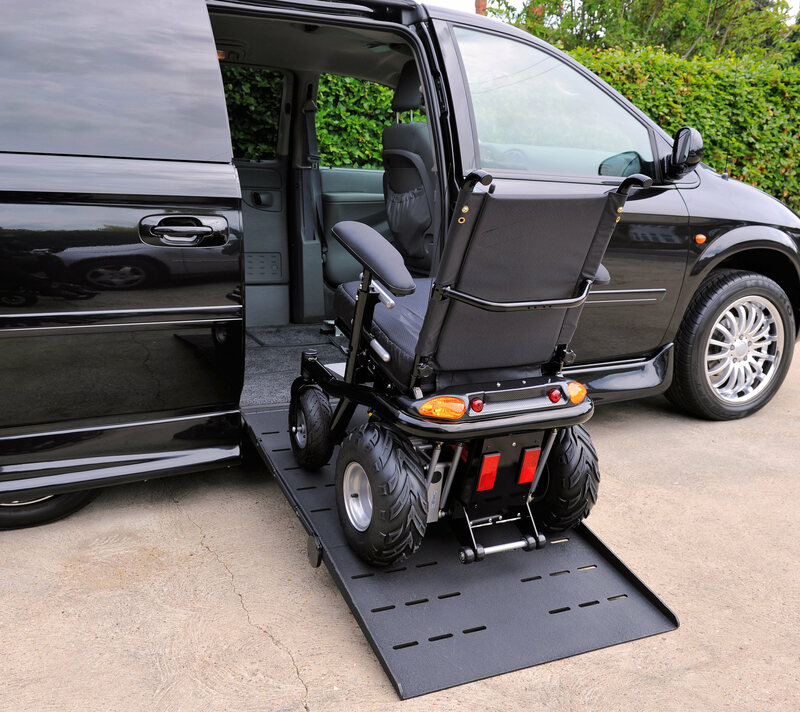 The computer controls and integrates the ramp, the sliding door and the winch that lowers the rear of the van. Then the doors are extended downwards and body skirts added along the sides. Once completed and repainted and re-trimmed it looks like a brand new showroom vehicle once again. With a difference! Look at the picture below. It shows the extra "size" and height and with my aftermarket wheels (18 x 8.5j ET35 with 245/50/18vr tyres) fitted it looks better and more substantial than the original vehicle like the blue one its parked next to.. 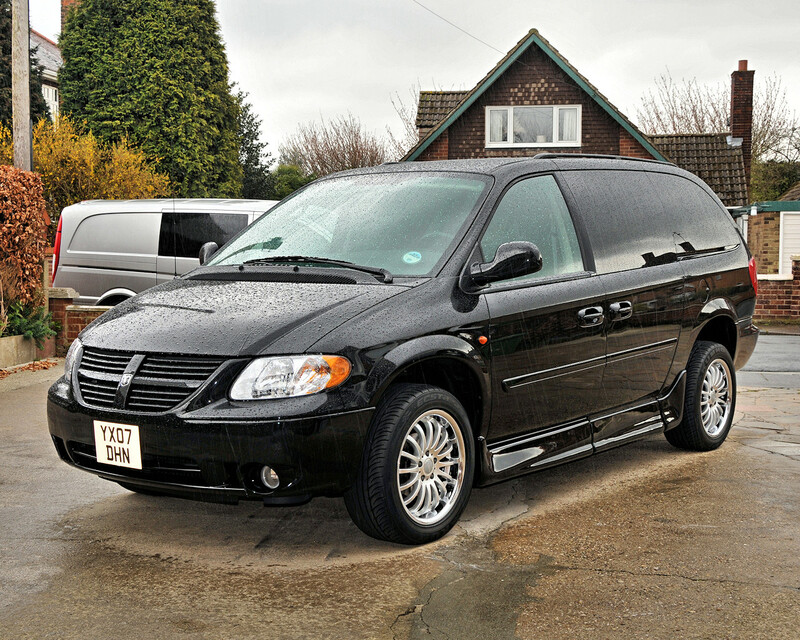 The picture on the right is my Rollx converted Dodge van parked next to a UK Chrysler Voyager. It shows the increased ride height, and the side skirts at the bottom that make the sides deeper. It makes the standard unmodified vans look sort of diminutive and old! The voyager is the same as the US "Town and Country" model. The front grill is about the only obvious difference between the standard vehicles. 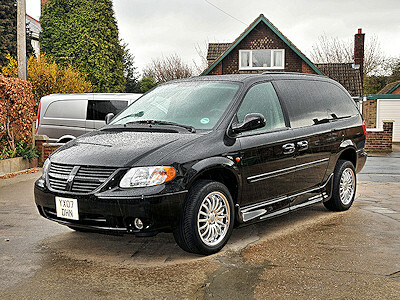 My van is really black in a limo/film/mafia kind of way and you feel good driving it! Handling, controls, and performance are all good. And with the extra wide wheels fitted any extra body roll caused by rollx increasing the height for ground clearance reasons is effectively cancelled out. They look cool too and are about an inch bigger in total diameter too so fill those huge arches much better. Desktops sizes below should you be interested! ***Imported on my behalf by Alfred Bekker Mobility in my own name. Because he does this regularly and has to fit the hand controls and wheelchair clamp. I could have imported it myself including all charges for shipping, customs, ministry test and lights conversion etc for 27,000 UK pounds. 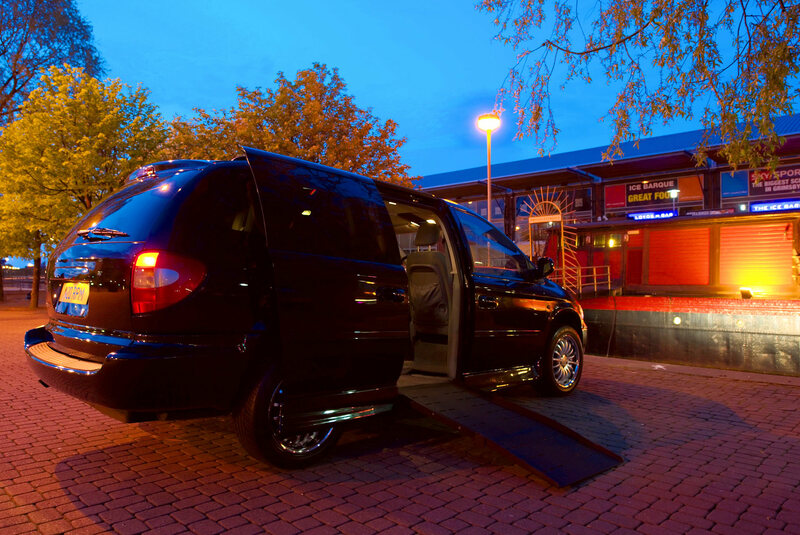 Alfred Bekker did it for 30k including fitting hand controls and powerchair clamp/tie down and all paperwork and a 12 month warranty on conversion and vehicle. While the Braun and the Rollx as well as VMI vans are near identical and almost interchangeable there are some other less well known minivan conversions that are not quite as suitable. Problems range from fit and finish as well as serious issues like this conversion below. 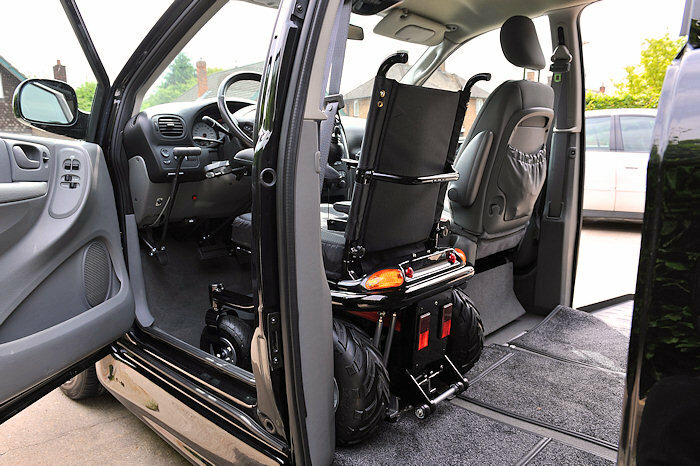 For example in my own van there is ample room to get my large powerchair up to the steering wheel centrally and correctly lined up. In the following picture that's not the case. This is the first van I ever looked at and it was simply not possible to get correctly lined up with the steering wheel due to the door pillar and the plastic trim covering it and the seat belt mechanism. See image. Not all conversions are the same!!! 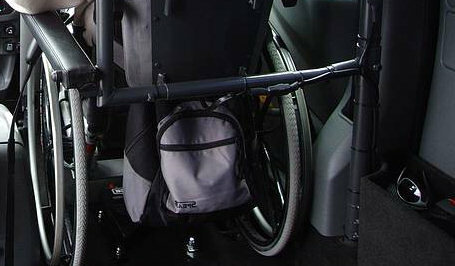 Look at the wheelchairs wheel and see how its hitting the door pillar at the bottom. In most US conversions this is removed and there is a larger wider flat floor area. This pillar makes the van feel and seem much smaller inside and prevents you getting lined up properly even in the narrow wheelchair pictured. I hope the manufacturers don't mind me pointing this out but it is pretty important! It probably only effects a few users but be careful! This is why you must see one and assess it before you buy. My van and most others are about a foot wider (300mm) at this point on the inside. At the pub in town in the summer evening... Lowered suspension not used this time so ramp is steeper.